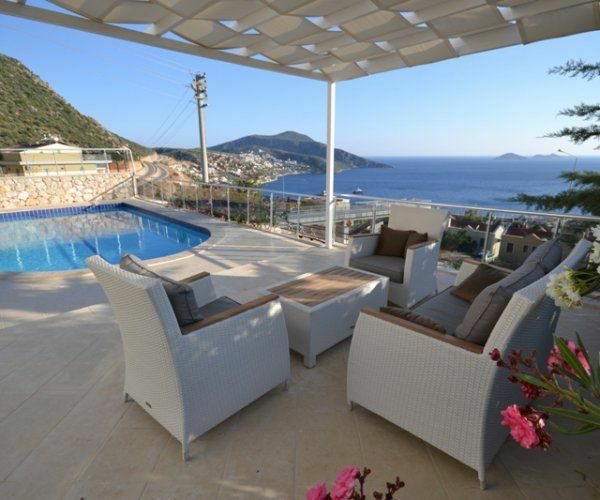 Located just a 5-minutes walk for center of Kalkan and beach, it has 4 bedrooms and wonderful views. It was restored in August 2013. It gets new look for your holiday. You can watch the sea while sitting by the pool. 1. Bedroom: a double bed, wardrobe, nightstand, dressing table, a balcony with spectacular views, air conditioning. 2. bedrooms; a double bed, wardrobe, bedside tables, dressing table, balcony with spectacular views, air conditioning. 3. bedrooms; two single beds, wardrobe, bedside tables. 4. bedrooms; two single beds, wardrobe, bedside tables, dressing table, air conditioning. There are fridge, dishwasher, kettle, microwave, oven, equipment of kitchen. There are wide-screen TV, and wonderful sea views. Private pool, sun loungers and parasols have been put into service with camellias. Free Wi-Fi ccess is available! The Villa has car-parking, garden, barbecue, iron and iron-board. Wi-Fi access, electricity, water, gas bills, and cleaning week, 7/24 help!